You’ll be shocked how easy it is to make homemade gluten -free gnocchi. Gnocchi is traditionally made with potatoes, eggs, salt and semolina flour. With just a few substitutions you can transform this normally glutenous dumpling into a delicious gluten- free dish. This recipe is from my new cookbook “The Missing Ingredient Living Gluten -Free”. 3- Bake for approximately 45 minutes to an hour depending on your oven. You should be able to push a fork into the potato with ease when they are done. Remove from oven and allow to cool. 5- Place the riced potatoes in a large bowl. Then add all the other ingredients. Using your hands combine well to create the dough. 6-Flour a large cutting board. Divide dough into smalls balls about the size of a tangerine. 7- Using the palm of your hands begin to roll the dough back and forth until it begins to form a long log about 1/4 inch thick. 8- Cut the roll every 1/4 inch to form the gnocchi. Repeat 7 & 8 with the remaining dough. 9- Place a large pot of salted water on the stove and bring it to a rolling boil. 10- In batches, drop gnocchi into the boiling water. 12- Place in a large serving bowl and cover with your favorite tomato sauce or cream sauce. 13-Top with torn basil and Parma. Serve immediately . 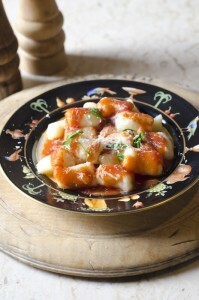 This entry was posted in Recipes and tagged Frank Baldasare The Missing Ingredient, Gluten free gnocchi, Living with Celiac Disease, The Missing Ingredient living gluten free. Bookmark the permalink.